I remember it clearly like it was yesterday. It was a clear summer, Sunday night of a festival that I was attending. Overall, it had been a really good event and as the last night wore on, I was in the zone for social dancing – that perfect state of flow where your dancing hits a peak. Those times when you literally dance every song the DJ plays and the ladies always leave the dance floor with a smile or a ‘WTF just happened’ look (but in a good way) after dancing with you. I continued my dancing spree when I got to dance with this particular Salsera in a skirt with a very long tail that went all the way down to her ankles. The dance begun and it was whirlwind of turns, moves, musicality and most importantly – connection. Needless to say, it was going really well. This is not the actual step, but the closest picture I could find that would help explain the move. and at the break in the Music when everything stopped to give way to silence, my partner broke free of my grasp and let out a shrill scream that literally had the entire congress floor stop and stare at us. 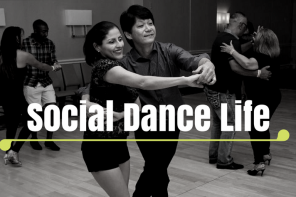 Before I knew what was going on, I saw my partner running off the dance floor and I had absolutely no idea why, nor what was going on. As I headed off after her I got some very mean deathly stares from both Men and Women who also had no idea what had happened, but hey, if a girl was screaming and a guy was chasing after her, then it must be the Guys fault. I caught up with the Salsera off the floor, she was surrounded by her friends and she was brimming bright red and holding her face in total embarrassment. As I was apologizing and try to find out what I did wrong, she informed me that the heel of her shoe had caught on to the tail of her skirt and had pulled it down around her ankles and she was flashing / mooning the entire dance floor. Hence the sudden pull of her hands to pull up her skirt and her quick departure off the dance floor. Should I Take Offence When Someone Does Not Dance With Me? To YouTube Or Not To YouTube? Twice I’ve had my tube top slip down. Fortunately, I always wore a strapless bra! I’ve gotten much better at securing them…I won’t give up on that fashion! Ha ha!